I killed the engine and stepped out my car. After the busy A9 my senses were soothed by pine scent and a luxurious silence, broken only by birdsong in the treetops. Not a soul about, and no other noise. To think I'd been in London a week ago! The contrast could not be greater. Dead pine needles littered the forest path and I walked away from the road, enchanted. This is a secret area, little visited, yet full of wildlife. The Abernethy forest is only a few miles from bustling Aviemore and the busy slopes of the Cairngorms, and is known as the place where ospreys reintroduced themselves to Britain in the 1960s. Apart from this, it is little visited. But it is more than just an osprey hide: this is the largest ancient Caledonian pine forest remaining, and is home to many creatures like capercaillie, red deer, crossbill and, higher up, grouse, ptarmigan, and mountain hare. I stroked the plated bark of the pine trees and lurked in the evening light by Loch Mallachie, watching the geese and ducks on the water. Next morning, after a late night in a secluded hostel with a pair of friendy Scousers, I wandered up Geal Charn, a small hill above the Abernethy Forest. The sandy banks of the Dorback Burn were teeming with rabbits, and lapwings circled and called from the surrounding fields. Once onto the heather the going was harder, grouse exploding at my feet, but I eventually reached the top to a wide view of monotonous moors, striped with muirburn, and the snowy Cairngorms in the distance. The Cairngorms are considered to be hills with long approach walks. But they are usually tackled from Aviemore or Braemar. To approach from Abernethy - or Tomintoul or Glen Avon - now that would be a proper long walk in! 'What's London got to do with Scotland?' You might ask. 'A lot!' is the answer. It's the nearest world city to Scotland, and has attracted on-the-make Scots like a magnet down the centuries. It's a busy, exciting place, larger, more varied and unknowable than any city in Scotland. 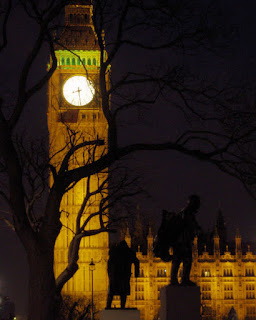 The population of greater London is bigger than that of the whole of Scotland! With something like half of all new-graduate jobs in the UK and the epicentre in Britain of national museums and galleries, yet only four and a half hours from the centre of Edinburgh by train, visits - or even permanent settlement - by generations of Scots is almost inevitable. It's also good for shopping, theatre shows, tourist sights - especially of the royal variety - and, once you've run out of money, wandering about, people-watching. 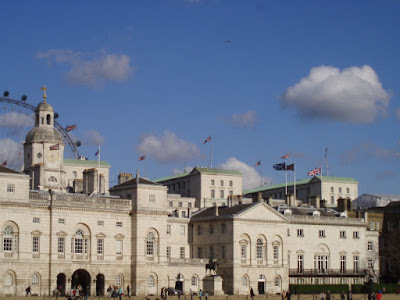 London is the capital of the UK, and so most of the important political decisions affecting Scotland are made behind the huge imperial edifaces of Westminster and Whitehall. The two most important people at the top of the tree are currently Scots - though, given the low popularity of Prime Minister Gordon Brown and Chancellor Alistair Darling in London, Scotland, and elsewhere, perhaps that is not something to feel particularly puffed up about. David Cameron, Gordon Brown's likely replacement, is, like the Queen, only semi-Scots. We were there on business, so didn't get the chance to wander about much, but still walked into a demo by Tamil protesters about the political situation in Sri Lanka. You don't get that kind of thing in Scotland. Edinburgh, on return, always seems cooler, smaller, saner - and no less breathtaking, in its own way. Last weekend, the Edinburgh Half Marathon was held. The normal route is from Ocean Terminal in Leith, to Cramond and back along the seafront - but this year it took an eccentric route from Meadowbank Stadium to Cockenzie and back to Musselburgh. There were serious runners, fun runners, charity fundraisers, people facing big personal challenges, from the front of the field to the plucky runner keeping up the rear, the sweeper bus growling at her heels. These people would have been out training through the recent cold snap, running round the likes of Arthur's Seat, using the public green spaces and keeping their fitness levels topped up. It was wonderful to see so many people there on a cool sunny day ready to run 13.1 miles. My knee was delicate from a big day in Glencoe the day before, and a big day was planned for the next day. I didn't want to do anything daft to my joints, so aimed for a personal worst. I managed this by a good margin - it must be the only race I've finished feeling better than I did when I started! This meant I was near the end of the field. The local RAF squadron were there in combat gear, rucksack and boots, as were a variety of superheroes - Captain America, Wonder Woman, etc. 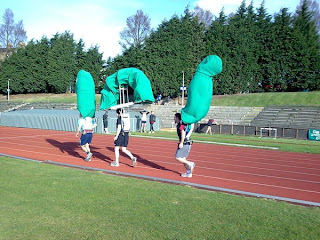 However all were overshadowed by Nessie, three men running in formation who raised the biggest cheers along the route. There are doing nine races this year - including, of course, a race at Loch Ness - and are raising money for SLA, a small charity providing education for poor Indian children, as well as Cancer Research UK. Good luck to them! Bidean nam Bian is one of the best hills in Scotland. Seven ridges, six corries and five tops fall away from the summit, which hosts a view of mountain, hill, sea, and island; the Aonach Eagach, Ben Nevis, Buchaille Etive Mor and Paps of Jura being especially notable. The ridges and corries each provide a different route to the summit, and these are some of the best in the country: the zig-zags on Gearr Aonach, the Lost Valley where the local clan once hid cattle stolen from their neighbours, Dinnertime Buttress on Aonach Dubh, the up-and-down ridge of Beinn Fhada... it is not possible to see Bidean in one walk, and several visits are required to explore the different areas of this superlative hill. Bidean is a hill I hold in great respect. Under winter conditions its wee, sharp, shy summit is guarded on all sides by cornices or airy ridges, and it takes cunning to work a safe route to the top and back. 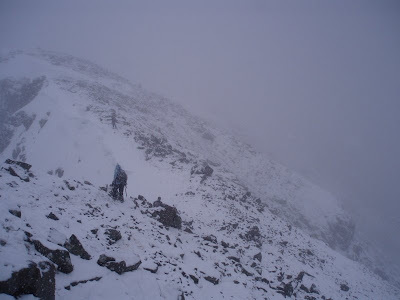 This week the conditions were semi-wintry, the cornices collapsed, the rain then wet snow invasive, chilling, and mildly disorientating in the mist and wind, especially for a speccy like me whose glasses kept misting over. But our group were of good heart: and we headed up Coire an Lochain, over a snow tightrope to Bidean, down past the head of the Lost Valley to Stob Coire Screamach, and descended safely into the Lairig Eilde, a herd of deer watching us amongst the streams cutting headlong down the hillside. When we broke out of the cloud we had spent six hours in the mist and walked over three hilltops. It was the first Munro I'd wandered over for over a year, and a major hillwalk for a Corbett and Marilyn-bagger.